CAE Healthcare's revolutionary female patient simulator, Athena, is wireless and tetherless. 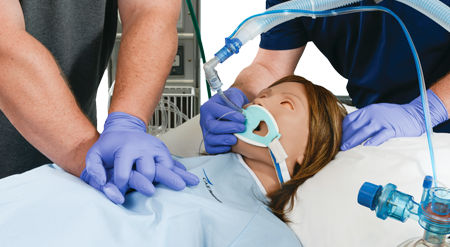 Athena is fully integrated with advanced airway management capabilities, female anatomy, authentic ventilation, and is AHA-compliant for CPR analysis. Athena represents the most sophisticated and realistic female patient simulator available today. The Athena female patient simulator is powered by CAE Healthcare's physiologically-modeled Müse® operating software, which gives training facilitators the option to easily run Simulated Clinical Experiences (SCEs), modify patient parameters and operate the simulator on-the-fly, or to manually control Athena with a hand-held tablet. Currently, there are no other high-fidelity, non-birthing female manikins that are anatomically correct. And, without access to a standard female simulator, many simulation training centers have had to make-do by dressing up their male manikins to give them a superficially female appearance. Athena fills this void with exceptional realism, product reliability, and technical versatility. With Athena, healthcare learners can now receive high fidelity, immersive training in the many nuances involved in assessing and treating the medical needs of women. We're excited about the opportunity to bring this female simulator to market, and hope you are too! * HCUP Facts and Figures: Statistics on Hospital-based Care in the United States, 2009. Rockville, MD: Agency for Healthcare Research and Quality, 2011 (ahrq.gov/).